KIEV, Ukraine -- Ukraine, in a break with tradition that is certain to rile Moscow, is ditching the Soviet name for World War Two and aims to adopt the poppy, a mainly British wartime symbol, to mark the 70th anniversary of the victory over Nazi Germany. 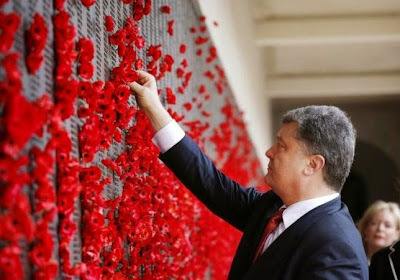 Ukraine's President Petro Poroshenko places a poppy in the World War I Honour Roll during their visit to the Australian War Memorial in Canberra, December 12, 2014. The moves, signaled by Prime Minister Arseny Yatseniuk on Wednesday, marked an attempt by Kiev to distance itself from Moscow's Soviet-style celebrations, planned for May 9, as the conflict with Russian-backed separatists in eastern Ukraine drags on. In another break with the Soviet past, Kiev will align its calendar with that of its European allies by adding for the first time May 8 - known in the West as Victory in Europe Day - as a national holiday. A decree signed by President Petro Poroshenko fixed May 8 as a day for reconciliation between those Ukrainians who fought only the Nazis with those who, after the war, went on to fight Soviet rule also. Ukraine will then mark Victory day on May 9 with its own war veterans' march in Kiev and several other big cities. Kiev, with most Western governments, is boycotting the World War Two victory festivities in Moscow because of Russia's role in the conflict in eastern Ukraine. Moscow denies it is arming the rebels. Kiev has announced plans for a sweeping security operation involving tens of thousands of police across Ukraine to guard against attacks by separatists or Russian agents during the festivities. Yatseniuk, whose government is set on a program of integration into the European mainstream following the ousting of a Moscow-backed president in February 2014, urged people to wear a poppy during the May victory celebrations in Kiev and other Ukrainian cities. He described it as a "European symbol". "Let all the other ribbons be worn by the Russian Federation which claims it was Russia that won the Second World War," Yatseniuk said. Yatseniuk's phrasing made clear he supported proposals to drop the Soviet name Great Patriotic War to describe the conflict against Nazi Germany that in the West is generally referred to as the Second World War or World War Two. The remembrance poppy was initially used, chiefly in Britain and among military veterans groups in its Commonwealth allies including Canada, Australia and New Zealand, to honor those killed in the 1914-18 war. But its use on remembrance day on November 11 has been widened to commemorate armed service staff killed in all conflicts since 1914, including World War Two. The move is part of broader changes undertaken by the pro-Western leadership to rid Ukraine of vestiges of Soviet rule following the conflict in the east in which more than 6,100 people have been killed. Monuments to Soviet state founder Vladimir Lenin are being removed or defiled and old Soviet street names eulogizing Soviet heroes are being changed in many parts of the country. In the east of Ukraine, a fragile ceasefire declared in February is holding, although the Kiev military said the situation remained tense near Mariupol, a coastal city on the Sea of Azov. An Mi-8 Russian military helicopter had also made a sortie from Crimea, annexed by Russia last year, and then returned to the peninsula, a military spokesman said. Alexander Hug, deputy chief of the Organization for Security and Cooperation in Europe's monitoring mission in Ukraine, told Reuters Television the situation was relatively quiet along the 500 km (312 mile) "contact line" between the warring sides. But he added there were "hot spots" particularly in Shyrokyne, a rebel-held point to the east of Mariupol, and in areas near the airport at the big regional city of Donetsk. The airport fell to the rebels earlier this year. "The current tranquillity is on very thin ice," Hug said.